I happened to be up at 5 a.m. Wednesday morning, April 15, working when Tiffany Maxwell (a.k.a. “Tiffany Sicling”) logged on to the OSGrid. 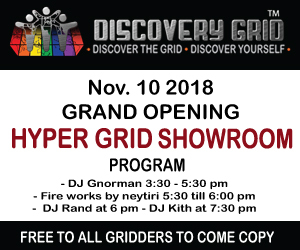 I’ve been meaning to talk to her about her work as the coordinator of the hypergrid team, which is developing ways for people to travel between different virtual worlds. Maxwell was still up, since she had just finished putting the final programming touches on a new Stargate – very much like the one in the movie or the television show. Later in the morning, she would present the finished gate to the rest of her team. She is based near Dallas, but the rest of her 11-member team are from around the world, she said. There had been some earlier, beta versions, cruder in design, with little choice in destinations and irregular in function, but the new Stargate is far advanced. “It can go anywhere,” said Maxwell. We were standing in front of it as she talked, in Nibiru. The place looks like a futuristic airport – for a good reason. Nibiru is one of the regions she’s put up herself, and it’s on the OSGrid, the largest grid in the universe. 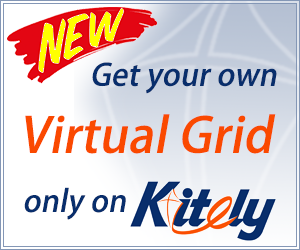 Anybody can install software on a server – even on their home computer – and host their own region of the OSGrid. Many of the volunteer developers who are working on the OpenSim project to just that. Maxwell is one of them. In real life, she works on Internet telephony and networking. She doesn’t get paid for her work on OpenSim. “It’s something I enjoy and believe in,” she said. She walked me from the central landing area down a corridor to a cavernous hall that was home to the new Stargate. Another, older model was off to the side, displaced by new technology. The new Stargate Maxwell helped build looked – and acted – like the one in the television series. She warned me to step back, then activated the Stargate. The “unstable energy vortex” flared out of the Stargate, then the Stargate filled with the blue “puddle of water” energy field. Maxwell used to spent time on Second Life, an alternative virtual reality that is currently a walled garden, with no links to other worlds, but it got too pricey for her – Second Life not only charges for land use, but also to upload content. In OpenSim, she can build as much as she wants – and does. She explained that one of the goals behind the creation of the Stargate was to allow people opportunities to interact with objects, instead of just pulling down a menu and clicking on an option. “You are the first to see this working on Nibiru,” she told me. Maxwell explained that she was a part of a small team focused exclusively on creating the Stargate. Other members included “Warin Cascabel,” who sculpted the gate. She created the DHD – the “Dial Home Device,” the small console that stands in front of the gate. “And I have been working on the scripting on the large gate,” she added. The scripts are the instructions that tell virtual objects that they should behave a certain way. Another developer, “Kidd Piko,” is working on getting the Stargate integrated with the Web, she said. The team is currently working on a portable gate that anybody can materialize on their land, which will automatically connect itself to all the other gates in all the virtual universes. She dialed up the destination. The chevrons around the perimeter of the gate locked into place. The energy vortex spilled out, then was replaced by the blue surface of the wormhole. As I stepped through, I was warned that I was entering the event horizon. You know how when you’re watching a movie with a roller coaster ride, you almost feel as you were on the roller coaster? In OpenSim, even though it’s a little cartoony character walking around, it really feels as though you are the one walking around in the world. Or, maybe, it’s just me. When I stepped through the Stargate – when my character stepped through the Stargate – it felt … real. A little on the cool side. I materialized on the other side. In the future, the gate on the receiving end will also fire up, and people near it will be able to see that people are arriving, Maxwell said. 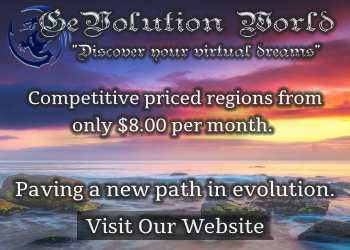 So far, the owners of 18 other virtual world grids have expressed interest setting up Stargates on their land and allowing cross-dimensional travelers, she added. Maxwell and I hung around for a while, chatting about the future of the Internet, and the fact that this was a historic occasion. We stepped through the Stargate again. Back on her land, she told me that she uses a Compaq Proliant DL360 G3 1U rack mounted server with dual processors to run her regions. She owns two servers total, in addition to her desktop and laptop, with a 20 megabit pipe to the Internet. Each server can handle four simulated regions, she said, and the high speed connection can handle up to 40 visitors at a time. The size of a single region is about 16 acres. If she was still in Second Life, she would be paying $300 a month for each region – plus the additional costs to upload content. “When OpenSim is fully operational and jumps to release out of alpha or beta, I think many people will move over,” she said. I asked her for her favorite places to visit. She told me that she likes the USGS elevation data mapped out at the ScienceSim, which is a grid backed by Intel and 3Di. “I’ve been so busy working on stuff that I haven’t had much time to explore many yet – but I will soon,” she said. Making the Stargate work required a great deal of coordination, she said, not only between the hypergrid team members but also with other groups. Developers working on the OpenSim code base had to install patches to enable the cross-grid teleports. Folks from Linden Labs, the company that runs Second Life helped, as did programmers from IBM. 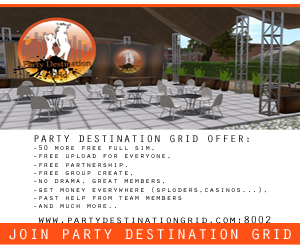 The OpenSim platform was originally reverse-engineered from the Second Life browser. One last bit of functionality the team is creating for the Stargate is to make the symbolic codes used in the television series work on these gates as well.